Everyone has those days when they awaken to unruly and misbehaving hair that refuses to do anything but look like a mess. It’s as if some sort of hair demon takes over during the night ready and waiting to give you a day of terrible looking locks. How selfish of it! Instead of getting angry and running for the scissors to chop it all off, pop a few key styling products through the mid-lengths and ends to give you back that control so you can leave the house having a great hair day. Hair isn’t winning this battle today! 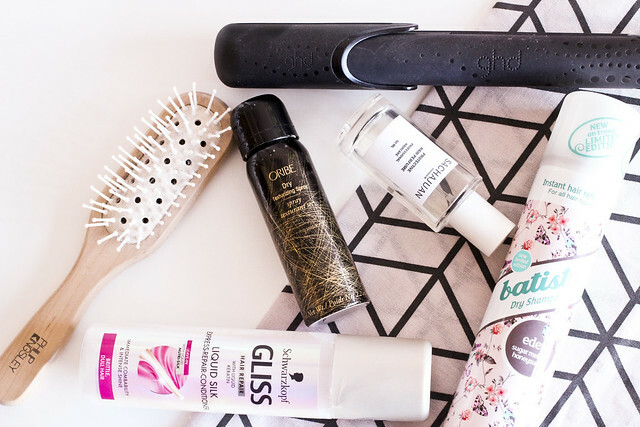 Whether my locks are looking a tad greasy, are sitting flat as a pancake or just need a bit of shushing up, I always start with my fail safe dry shampoo – Batiste. Their new Eden* scent is refreshing and packed full of sugar melon and honeysuckle which smells pretty amaze. After dry shampoo that I always end up spritzing one time too many I go in with two of my fail safe tools that remove any frizz, release the shine back through my tresses all whilst giving it that freshly washed look. The Schwarzkopf Gliss Liquid Silk Condition instantly revives lacklustre hair and to help with application I spray it onto the Philip Kingsley Vented Grooming Brush*. Enabling me to brush the product directly through the lengths of my hair this transforms the condition and boosts those shine levels. If I’m heading out with friends or need some serious volume and texture, it’s got to be the infamous Oribe Dry Texturizing Spray. This is this shiz and seriously works wonders to ignite the life back into flat locks. If my hair still needs a bit of a hit to kick it back into action I heat up my trusty GHD V Gold Straightners*. Running through any kinks or used to curl a bit of movement throughout the lengths, this gives me a style that I can actually work with. By now my hair is back on board and starting to resemble something a tad more normal then it’s original birds nest, to reward it’s good behaviour I finish off with a couple of spritzes of the Sachajuan Protective Hair Perfume* for a kick more shine that lasts throughout the day. This entry was posted in Beauty, Hair and tagged shampoo, spray. Bookmark the permalink.